Tokyo Gohan Film Festival is the annual film festival that celebrates the richness of film and food culture. We gather films that show abundance of daily meals, and those depict strong human bonds created over food. In Japan, we call our daily meals “Gohan” (the sound ‘Go’, added in respect to the following noun ‘Han (meal)’), with much respect and love for what we eat. It is also traditional to appreciate food and culture in association with seasons, as in the phrase “Autumn, the season for art　and appetite”. Traditional Japanese cuisine “Washoku” was added to UNESCO’s Intangible Cultural Heritage List in 2013. Tokyo, being the city that came under the spotlight as one of the ‘Gourmet Cities in the world’, we wish to introduce a new culture mix of food and film. Tokyo Gohan Film Festival screens wide selection of films with impressive dining scenes from up and coming by new talents, classic masterpieces, and documentaries. 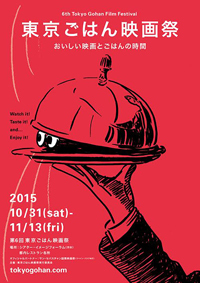 Enjoy the TOKYO’s latest food culture through the film selection of Tokyo Gohan Film Festival! Commencing from its 2014 screening, Tokyo Gohan Film Festival formed an official partnership with San Sebastian International Film Festival, the international film festival held in one of the most celebrated gourmet town in the world, the Basque province in Spain. Through this partnership, the juries from Tokyo Gohan Film Festival will join the selection process of the best picture for the Culinary Cinema Award, and the prize of 10,000 Euro will be awarded to the film. The winning film will be screened at Tokyo Gohan Film Festival as an Asian premiere. We wish this partnership will create a meaningful meeting point for the world’s great food cultures and traditions, and lead towards the future.